Lars Iyer’s debut novel comes from the admirable Melville House, home of Lee Rourke’s The Canal and Hans Fallada and the Art of the Novella series. It also features high praise on the back cover from Rourke and Steve Mitchelmore, a reliable source of recommendations. 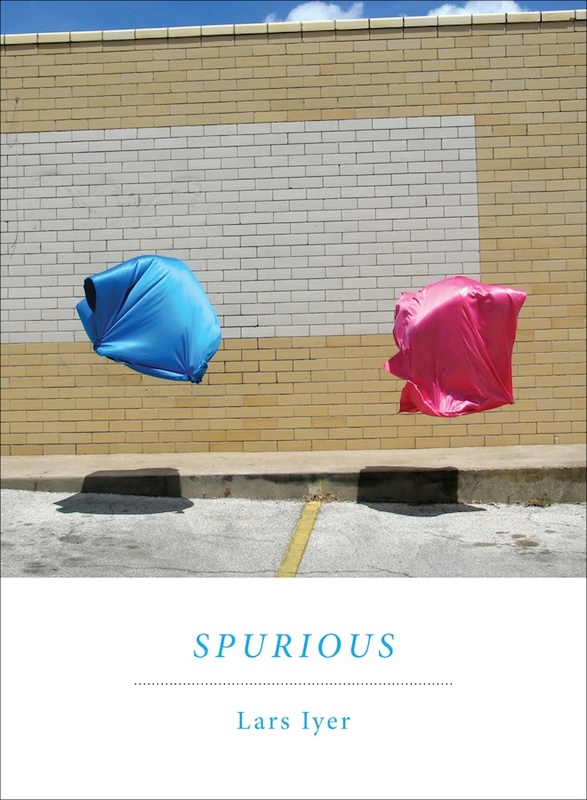 Spurious began life as a blog, and its genesis shows: the chapters are short, like blogposts, and the consistency of voice and repetition of themes both emphasises and distracts the reader from the fact that there is not much directional plot. There is a little bit of plot, about damp growing in the narrator’s home (“The greatest experts on damp are completely baffled”), but a real plot would be unwelcome here. It would have driven me on and prevented me from stopping on almost every page to smile, think, or sense a cartoon lightbulb of understanding begin to glow above my head before popping out just as I concentrated on it. (With a plot, the lightbulb would never even have got going.) Instead, it has a spiral narrative – a Spirograph narrative! – turning on itself so you can see the same things passing over and over, a little closer or further away, from a different angle or level of familiarity. Spurious is full of paradox. It’s about everything and nothing. It’s a funny book which uses exclamation marks (I know!). It provokes thought while evading easy understanding. Its characters speak simply about knotty concepts. The characters are the narrator, Lars, and his friend W. Most of what Lars tells us is reporting what W. says to him: we know more of what W. thinks than of what Lars does. W. speaks his mind (and Lars speaks W.’s mind too): “‘When did you know,’ W. says with great insistence. ‘When did you know you weren’t going to amount to anything? '” He is relentlessly critical of Lars. “It’s my fault, W. says. Everything went wrong when he met me.” But the lightness of touch, the artfulness in the repetition, means that it sounds not like bullying but an exaggerated, hyperreal version of banter between friends. W. and I never think about our deaths or anything like that. That would be pure melodrama. Besides, if we died, others would come along to replace us. Our position is structural, we’ve always been convinced of that. We’re only signs or syndromes of some great collapse, and our deaths will be no more significant than those of summer flies in empty rooms. Lars and W. travel in the book, mostly from the south-west of England where W. lives to the north-east, Lars’s home. But they may as well stay in the same room, conversing all the time. What W. wants is for every conversation to be “something great, something life-changing.” His fantasy is “a group of friends who could make one another think.” He longs for “the twenty-second century, or the twenty-third, when things might start getting better again.” He wants all conversations “to go from the apocalyptic to the messianic.” He is insufferable, but inseparable from Lars. They are like two aspects of the same character, the warring mind of someone who acknowledges his limitations but nags at himself for accepting them. How far apart, too, are the author and his characters? So far I have written about Spurious as though there was no author, so effectively does the book have its own life. Iyer has given an interview where he explains the origins of the blog and the novel, though I am trying to forget it as it imposes too much on my own reading. Anyway, when W. has a book published toward the end of Spurious, Lars agrees that “His book is better than him.” Writers suffer illness, get distracted, talk rubbish. Their books endure. Lars fears “the empty time which makes thought possible.” Spurious is fully attuned to our times, where thought is impossible because of our inability to stay off Twitter, and with no empty time we never properly think. W. wants friends who can make him think. Too bad: he will just have to make do with books that can be friends, books that make you think and entertain you at the same time, like this one. One utterly trivial comment – I love the spurious pic! It looks like a couple of headscarves without the women who should be wearing them. I think there are quite a number of writers whose books are better than they are. Which is why books are so important, I guess. They create a collective vision of perfection to spur us on. Does the cover not remind you of the short film bit from American Beauty, with the plastic bag dancing on the wind? I’m glad someone else said that. It reminded me overwhelmingly of that bit from that film. Yes, a distinct resemblance. But not enough for a breach of copyright action, methinks. Nick has already commented on the cover of this book, there is something very intriguing about it, it has a kind of hypnotic and surreal quality. Light, silken scarves flying up in the air, with a dark (painted?) and much too solid shadow. And this sunny wall – what is it hiding? All these are thoughts I had before even starting to read your text… and then your great review only gave me a lot of other questions to go on with. I think I will love to read this book! I have a copy of this too. Melville House sent me one as I imagine they did you. It was on its way to the bin (it sounded Sophie’s Worldish) when I noticed the Lee Rourke quote. I’m glad I retrieved it because since then I’ve heard nothing but good about it and here you are praising it too! Exclamation marks. Infectious little buggers. Still, even with them I will at some point read it and it sounds like it should be fun when I do. An excellent review, John! It has made Spurious a must-read for me. I find the Beckett connection particularly enticing, since it shows that a writer whose work once heralded ‘the end of the novel’ continues to inspire new artists and new forms. It also sounds like Iyer has used a contemporary format (the blog) in an intriguing way. That’s good news. I’ll be curious to see how well it works. I wonder what you make of the title, or would that give too much away? Hi Kevin. Thanks for your comment. The title is explained pretty straightforwardly by Iyer in the interview I referred to above. I think this title captures something of that feeling W. and Lars have towards the thinkers and writers who fascinate them, and towards the world from which those thinkers and writers emerge: a feeling of not quite measuring up, of not quite belonging to something. Max, I haven’t read Sophie’s World but I am pretty sure that Spurious is nothing like that… I look forward to hearing your thoughts. I’m sure of the same thing John. It was a false initial impression, happily corrected. Why is it that every book you review on here I immediately want to rush off and read? Thanks Neil – though I hope not every review makes you want to read the book (thinking of the likes of Room, Imperial Bedrooms, Beatrice and Virgil…)! aha, yes, Beatrice and Virgil in particular does sound particularly grim. Though sometimes I like to read something that is a total fail in order to make me feel better about my own writing.